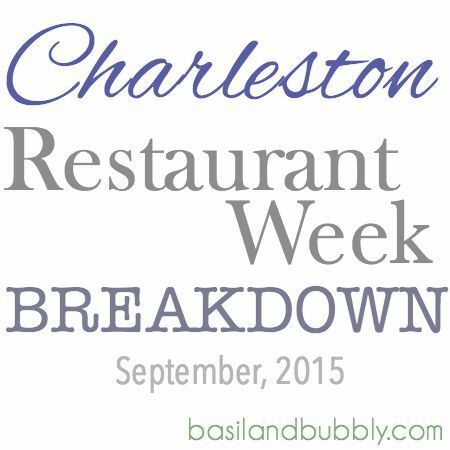 It’s that time of year again: Charleston Restaurant Week! Running from September 9th – 20th, restaurants all over town will be featuring prix fixe specials to lure foodies into their dining rooms. Every year this event gets bigger and bigger, and sometimes with all the options, starts to feel a little watered down. Here are my picks for the best places to eat during restaurant week, and what to get when you’re there, plus a few to avoid. Um. Okay. Is anyone else confused here? $35.15? Is this some inside joke that I missed? Regardless, I’m going with Street Corn Salad ( Grilled Corn, Peppers, Spinach, Pickled Onions, Feta, Popcorn, Crema ), Duck Confit ( Duck Confit, Tomatoes, Okra, Chinese Long Beans, Olives, Herbed Bread Crumbs, Duck Jus ), and Horchata Panna Cotta. Fish wins the “I’ll Have One of Everything, Please” award. It was the only menu where I struggled to select just one item from each course. I think I’ll have the Sweet Chili Calamari. No, wait, the Octopus. No, no, the Blackbird Farm Salad. No, the Octopus. Yes, the Octopus ( potato, tomato, niçoise olives, haricot vert quail egg, spicy tapenade). For the main course, the Snapper (tomato & zucchini goat cheese pie, arugula fennel salad crawfish green curry ), but boy, does that Bouillabaisse look amazing, too! For dessert, Dim Sum — a little bite of everything. If you’ve ever met me in person and we’ve talked for more than one hour, it’s safe to say you’ve heard me slip in some disparaging remarks about chain restaurants. I do not do chain restaurants. Mostly. A lot of people are upset that Ruth’s Chris has opened up shop in the heart of downtown, and although I don’t feel it’s an appropriate location for the chain, I am interested and would like to give it a try. Plus, Hall’s is already booked to the gills for the entire week. $40 for three courses is as cheap as any meal is every going to get at Ruth’s Chris, so swallow your pride, grab your beau, and get a Steak House Salad with Blue Cheese Dressing, a Petite Filet ( served with Potato Gratin ), add a vegetable off the main menu for $1 off, and finish off the whole meal with a Mini Bread Pudding with Whiskey Sauce. Never mind that not only is it the most expensive option for one person this year, ( okay okay, it is the most expensive menu EVER for Charleston Restaurant Week ), it’s Zero George and I’m dying to go. Nestled in what I consider to be one of the most perfect hotels in the country, Zero George Cafe and Bar sounds like a place hotel guests might grab a marginal coffee and day-old pastry on their way out the door, but it’s not. The food is art. The menu reads like a pretentious parody of a modern menu. You want to hate it, but you also really, really want to try it all. The Octopus on their standard sample menu isn’t served with “greens” or a “salad”; it’s accompanied by “various leaves”, a phrase that makes me laugh out loud even as I re-read it here. I’m tempted to make a mulch joke, but I’m so interested to eat there that I can’t bring myself to poke too much fun before actually eating the food. So what to get from the Restaurant Week menu? For starters, it’s a dead tie between the Crispy Garlic Panisse ( Confit Lamb Belly, Lightly Torched Robiola dua Latte ) and the Ricotta Tortellini ( Roasted Hen of the Woods Mushroom, Crispy Kale, Pine Nut Emulsion ). Dinner will without a doubt be Dry Aged Duck, with Sunchoke, Roasted Dates, Caramelized Brussel Leaves, Puffed Sorghum, and Aged Bone Jus. For dessert? Artisanal Cheeses, with one last glass of wine that I probably don’t need. I’ve been to Oak several times during previous restaurant weeks, and they have under-delivered each time. For one thing, they list “Filet Mignon” on their menu, implying that you will be getting a portion of steak, when really the Filet Mignon dish is sliced tenderloin — technically NOT filet mignon, and the portion is smaller than everywhere else in town during restaurant week. If it were not a steakhouse, I might let that slide, but it has always felt decidedly shady to me that a place that should be experts on steak are passing off a sliced tenderloin as a true Filet Mignon. Pass. Let me be clear, I really like Sermet’s. I have never had a bad meal there, and they are ( generally speaking ) very well priced for the quality of food and service you get there. However, their restaurant week menu is just … weak. Only one option for an entrée, and as a whole, the menu looks like the restaurant will be making quite a high profit on anyone who orders from it — more so than usual. Sermet’s is in no way alone in this type of menu this week, but it is the one that most disappointed me, because I’ve come to expect better from them. This menu gets the “Worst Value” award. I love burrata, so they get some points for that being on the menu, but the fact that you could have a house salad, cacio e pepe, and panna cotta for $30 seems nuts to me. I am a huge fan of cacio e pepe, and I realize the skill it takes to make it perfectly, but I find it highly unlikely that they are cranking out dish after dish of perfect cacio e pepe, and I get the feeling that I’d feel ripped off after getting a plate of pasta, cheese, pepper, and pasta water as the main player for a $30 dinner. I don’t feel much better about the other option, chicken piccata, either. Sorry, Vincent Chicco’s. See all of the restaurants participating in Restaurant Week here. Basil is always my favorite during restaurant week but I might have to try Fish this time around! I did see their menu, and it looked awesome — I almost added it to the list! I’m going to Zero George tonight! I’ll let you know how it is! I went to the Macintosh for restaurant week last year and it was a huge disappointment. Staff clearly couldn’t care less about customer satisfaction for diners ordering off of the restaurant week menu and we wee seated half an hour after our reservation, which was just the start to a pretty disappointing evening. Oak was similar, plus I HATE that they pre cut my steak, so it was cold when it arrived. Oh no!! I would have expected so much more from the Macintosh! Usually they are on point. I’m with you on Oak — I’ve yet to have a decent restaurant week experience there. Keep me updated on Zero George, for sure! I’m DYING to go. Love this post! I won’t be in town this year for restaurant week but I’m definitely wishing I was! I did Fish another time for restaurant week and was hugely disappointed. Everything was bite size, and we ended up grabbing more food elsewhere.. Hopefully they’ve stepped it up some since that menu sounds good! I hate to hear that! I hope these restaurants realize that this is a showcase of their talents, and is often not a good deal ( like it once was ), so they need to step it up. I’m not going to return to a place that snubbed me at Restaurant Week any other time of the year! People remember that stuff! Great idea for a post! Honestly, I end up skipping out on restaurant week most of the time. OR I go to restaurants that aren’t participating. I rarely need three courses at a restaurant and in my experiences, it’s not their best dishes. I will say, though, sometimes the super cheap restaurants are fun when you can share. If I want some “bad for me food” then Wild Wing and Reds have good 3 for $20 that you can share. That’s one of the things that gave me the idea for the post: I’ve had too many Restaurant Week meals that were simply “meh”. I have high hopes for these picks, even though a few people have me thinking twice already! I had no clue Reds and Wild Wing got in on it! I can def see how that could be the way to go.